Join a guided snorkeling excursion and explore the fascinating underwater creatures of Príncipe island. 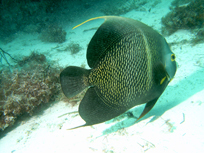 There is a wide range of species found in our local beach Praia Banana, which can be accessed within 50m of the shore. 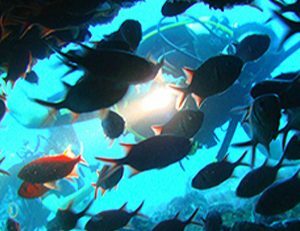 Alternatively you can come out on our boat to offshore sites that possess different underwater scenery and species. 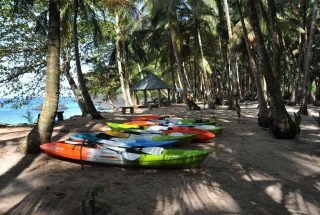 Kayaks are available at Praia Banana, which can be used to access other nearby beach and admire the dramatic cliffs, rainforest and mountainous landscape from the water. Be at one with the ocean and float on calm blue tropical waters. Be guided in an underwater experience you won’t forget, whether it is by boat, shore or at night, the underwater life is unique with a range of Carribbean, Indian Ocean and endemic species. Within metres of Belo Monte’s main beach there is a wide range of marine life to explore, with the ease and comfort of the hotel’s facilities when you get out the water. Along the beachfront there is a boulder reef with numerous small fishes and invertebrates, which is particularly fascinating at night when the nocturnal shift of creatures come out. Following the cliffs towards Praia Preta offers both snorkelers and divers a colourful rocky reef with corals, large shoals of surgeonfish, damselfish and angelfish. 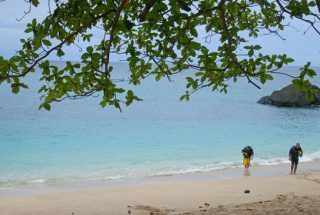 In this site you can go as near or as far as you like and see many of Príncipe’s marine wonders. In the bay of Praia Burras, Pedra Adalio is a patch reef that concentrates the fish life from the surrounding area. In the nooks and crannies there are various species of grouper and wrasse, while sea breams and snappers circle above the reef. Look out for the octopuses that build themselves a home from shells and the symbiotic prawn gobies in sand around the base of the reef. The calm waters of the bay make this a very relaxed boat dive just 5 minutes from Praia Banana. Off the northern tip of the island is a small islet surrounded by beautiful rocky reefs. Currents often sweep past this spot encouraging large schools of snapper and filter feeders to congregate around the underwater pillars and caves formed from the basaltic bedrock. In the right spot you can shelter from current and watch the life around you or just go with the flow and do this site as a drift dive. Four kilometres offshore Pedra de Galé rises vertically from the seabed to form a magnificent wall swarming with fish of every kind. Its offshore location and difficult waters mean that there is less fishing pressure here and you can see big snapper, barracuda, rainbow runners and other predatory fish. This is not a dive for the faint hearted, but if you are willing to be adventurous, you will not be disappointed. Crystal clear oceanic waters allow you to appreciate dramatic geology and give the sense of an underwater skyscrapers. This is truly a unique dive. 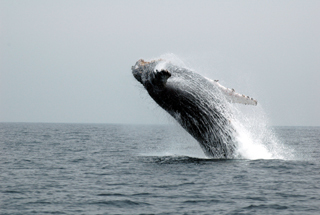 From August to October the humpback whales are seen, and often heard singing from the various lookout points on the island. Whether you view them from the land or by boat, these amazing creatures are something for all to see, watching move through the water, with such grace and ease for such huge animals. Three different species of turtle come ashore from October to December to lay their eggs. It is a moving experience to watch them come onto the land to watch them dig their nests and lay eggs. 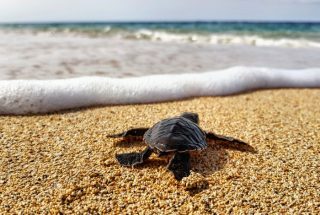 From December to April, the hatchlings emerge and rush into the ocean as quickly as possible, to start their lives wandering the open ocean as far as Brazil and Portugal.